I was born and raised in South Louisiana in the very heart of Cajun country (though many people are surprised by this because of my lack of Cajun or otherwise southern accent). Although I haven’t lived in Louisiana for eight years or so, my roots are still there and in Louisiana this time of year is King Cake Season. 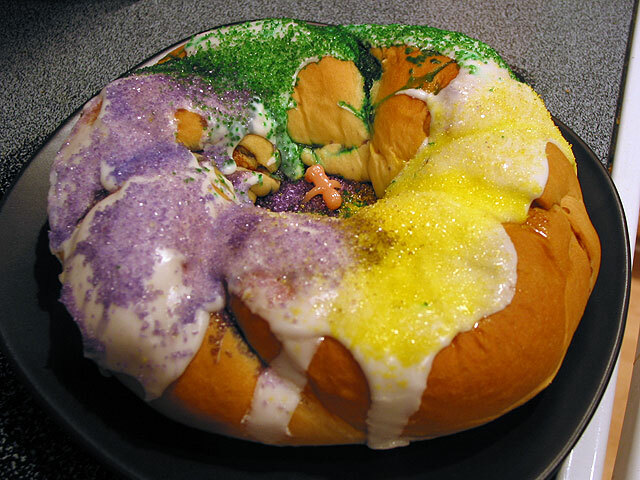 A King Cake is a traditional Mardi Gras/Pre-Lenten food that is basically a Danish or sweet-bread type dough with a filling (commonly cream cheese, cinnamon pecan, or cherry bourbon) that is baked in the shape of a braided circle and topped with a glaze and green, purple, and yellow colored sugar. Traditionally a small plastic baby, representing Baby Jesus is baked into the cake and there are various traditions for the person who gets the baby in their slice of cake. 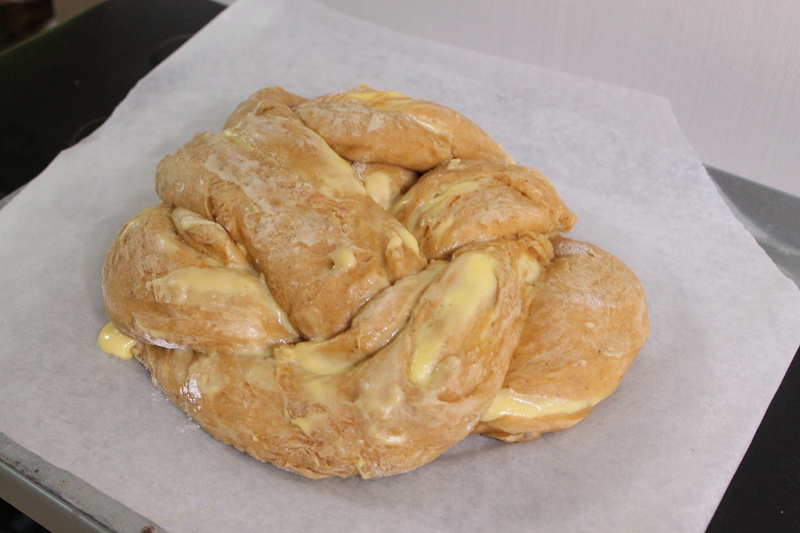 The name “King Cake” comes from the biblical three kings who followed the star to Jesus at Epiphany. Although my family wasn’t all that enthusiastic about Mardi Gras, we always had at least one King Cake. I especially remember the smell of them and the way the scent seemed to flow out of the bakeries and into the streets themselves in February and March. I don’t remember the last time I had King Cake in Louisiana – it’s probably been eight years or more. So for my Week 5 adventure I decided I’d try to make one. I’m an avid baker, but I’ve never attempted a King Cake before. Here in Korea I don’t have a full-sized oven, just a large convection/toaster oven. I’ve also had a lot of trouble with yeast here – something about the dampness/dryness and temperature fluctuations seems to make it extra finicky. But I decided to give it a go. 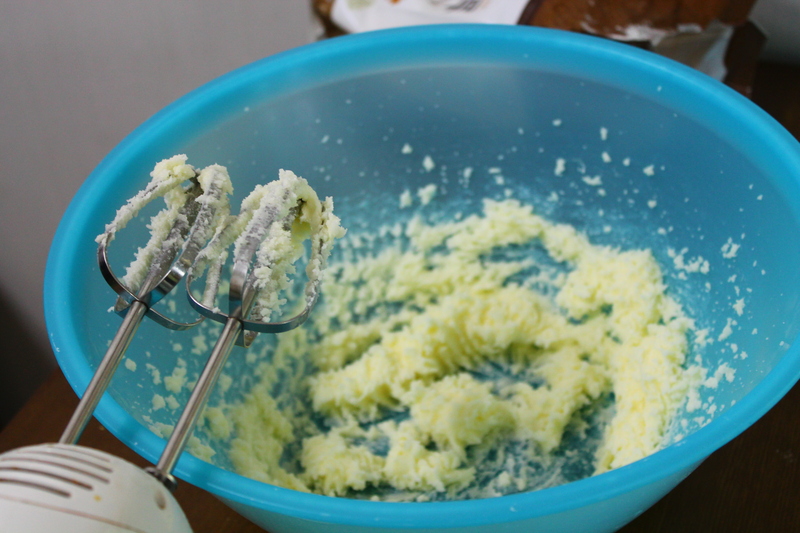 I followed this recipe as closely as possible though I think I’d try a different one in the future. First I made the bread dough and put it near the space heater to let it rise. (We don’t have central heat so it’s hard to find a spot warm enough for the yeast to activate). Next I made a cream cheese filling which I admit to sampling generous amounts of before using it (I’m a sucker for anything sweet and creamy). 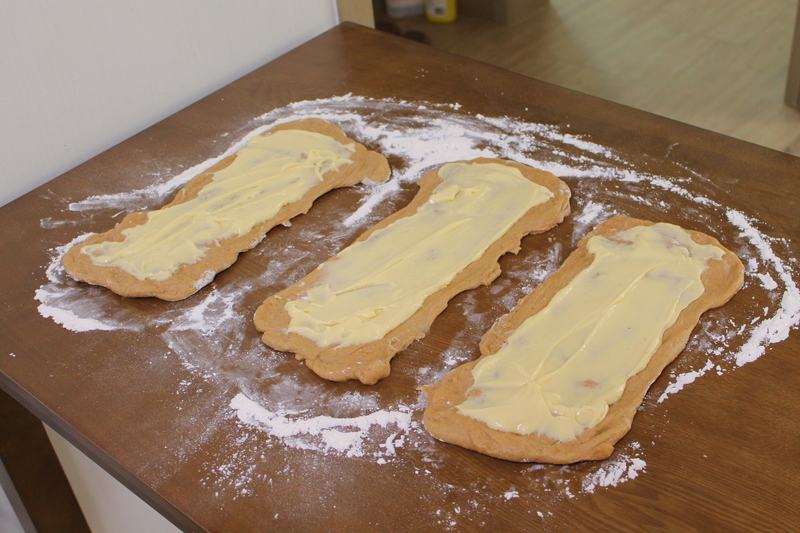 I rolled the dough into three pieces and spread the filing over each piece. Then I rolled each piece up long-ways and sealed the edges. I braided the three pieces together and formed them into a circle. I let it rise a bit longer. It rose sort of unevenly and closed up the hole that was supposed to be in the middle, but oh well! I painted an egg and milk wash over the top after it was finished rising and then baked that sucker! In the end, it was hard to get it cooked all the way though the center without burning the edges cause my little mini oven isn’t the greatest. But I was still pretty proud of how it turned out. There was a lemony icing that went over the top, but I didn’t get a picture of it. I also didn’t have any colored sugar crystals so it didn’t look that impressive anyway. Overall it was a good experiment, though kind of a lot of work. The whole process (with rising time) took about 4 hours. 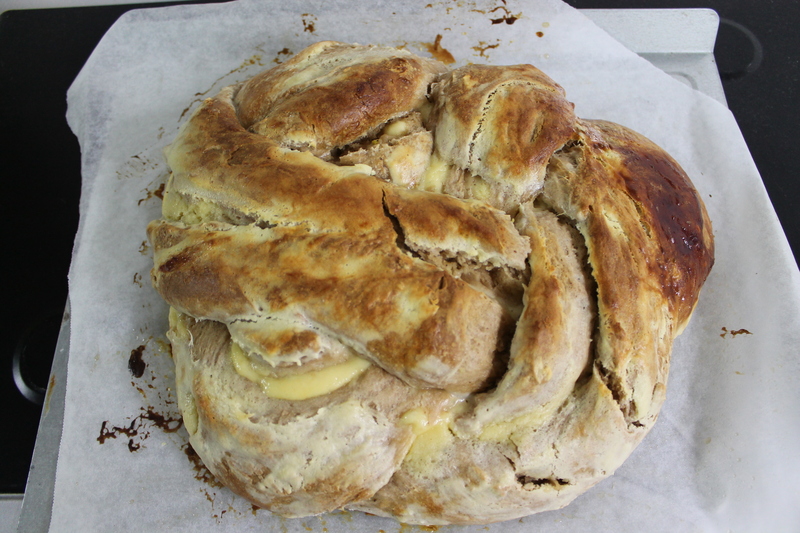 It wasn’t as good as a King Cake from home, but it was a decent first try. If I make it in the future I might try a different recipe for comparison. After several weeks of traveling I knew my Week 5 adventure would be low-key, but I’m proud of trying something new and finding a way to connect to my home from far away. As we say in Louisiana, “Laissez les bon temps rouler!” – Let the good times roll! If you have an adventure to share, add your link to the link-up by clicking the link below. You can participate in all of the adventures or you can just do a few – no pressure. If you missed last week’s adventure you can find it here. And if you are new to my Fifty-Two Weeks of Adventure project you can find out more about it here. I love this!! 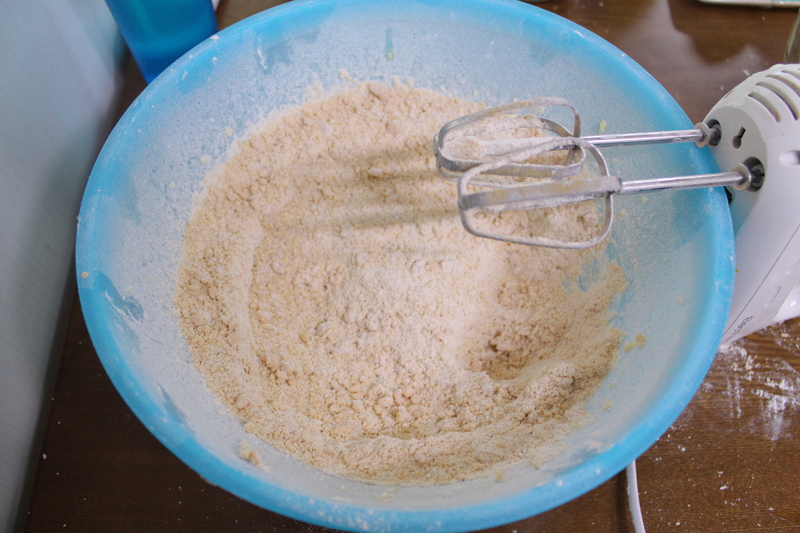 I may have to try it… Just curious, what other recipe would you try if you did it again? My mom is also from New Orleans – we went to parades and things like that when I was young but as I got older I think my parents were more and more disenchanted with the drunken revelry and didn’t think it was a great place to take us kids so we started going on mini vacations to get out of town for Mardi Gras. Even so, it’s a very pervasive part of the culture so you can’t really escape it even if you aren’t actively participating. You may be able to find one somewhere in Europe, Angela. Particularly in France and wherever they celebrate Carnival. I doubt it’s quite the same as the Louisiana version, but I’d be interested to know the differences! Yea its pretty smashed even when it gets here. But it still tastes amazing! Its from Randazzo’s (i think thats how you say it) anyway, i really wanted the lemon one but they were out. I bet yours was yummy! Oh yea- my six year old daughter got the baby twice so she broke open her piggy bank and put all her money in plastic bags so she could buy the next one! Dont you know we had the hardest time telling her we couldnt find them around here. Aww, that’s so cute! I always badly wanted to get the baby, but my brother used to collect them and then melt them using a magnifying class and the sun. It was traumatizing. I can imagine that being a tad freaky! Nice work! I feel like everyone has their own version of the fruit cake and for some reason this reminded me of one. I’m glad you can get them in Florida! I imagine you can get them a few other places in the South as well though it will never be quite the same as those ones you grow up with.